Amidst several global issues, the ever increasing environmental pollution and simultaneous depletion of conventional fuel reserves have evolved as major challenges to deal with. The quest for alternative sources of energy with environmental sustainability has led the scientific community to explore the several options of biomass energy. Biofuels are the biomass-derived liquid fuels, which are capable of supplementing petroleum fuels, even can replace them. Pyrolytic oil and biodiesel are some of the liquid biofuels that have come to the existence, but when the fermentation-based biofuels are considered bioethanol and biobutanol have emerged as the available options. A unique fermentation process named acetone–butanol–ethanol (ABE) fermentation carried out by Clostridium sp. is the preferable one for synthesizing biofuels like bioethanol and biobutanol as well as an industrial solvent like acetone. There are several types of biomasses available which can serve as raw materials for ABE fermentation. In order to make the process economical and environmentally viable, the usage of lignocellulosic biomasses is a common practice. However, the lignocellulosic biomasses have to undergo pretreatment to release simple sugars in an aqueous form called as hydrolysate. The hydrolysate has to be detoxified to remove inhibitory compounds before feeding them as the substrates for fermentation. The fermentation process in itself is really challenging and needs effective regulation for uninterrupted progress. The efficiency of the fermentation can be enhanced by modifying the bacteria by mutation/genetic engineering to make them perform optimally even during adverse conditions. Product recovery from fermentation broth has emerged as the toughest task. Gas stripping and adsorption are a few among the other methods to be energy efficient and effective in product separation. 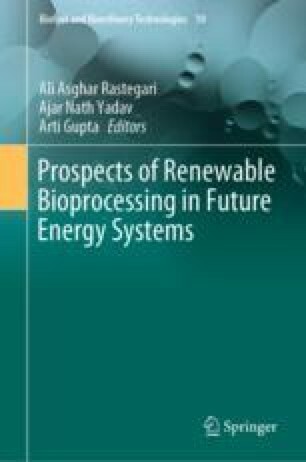 Biofuel production via fermentation on an industrial scale is still in a rudimentary state and demands extensive research work for making the commercial scale production and usage a reality. The authors are thankful to Springer Nature for providing an opportunity to become a part of the book series. The authors would like to convey their gratitude towards all the editors of the book especially Dr. Ali Asghar Rastegari, Dr. Ajar Nath Yadav and Mr. Nareshkumar Mani, Project Coordinator, Books Production, Springer Nature for providing all the requisite information in due course of time. Last but not the least the authors are also thankful to the Ministry of human resource development (MHRD), Government of India and the Director of NIT, Rourkela for providing necessary facilities during the course of preparation of this literary work.